Example use case: A visitor, Simon Smith, has asked you to remove all personal information you have collected on him. Please note, to anonymize a visitor, you firstly need to archive the visitor, you will then anonymize from the archive view and only signed-out visitors can be archived. Select a visitor in the Visitors tab. Once the visitor is archived, the data will appear as shown below. Navigate to the 'Archive' view, select the visitor you wish to anonymize by clicking on the checkbox to the right of their name and then click on the 'Anonymize Selection' button. 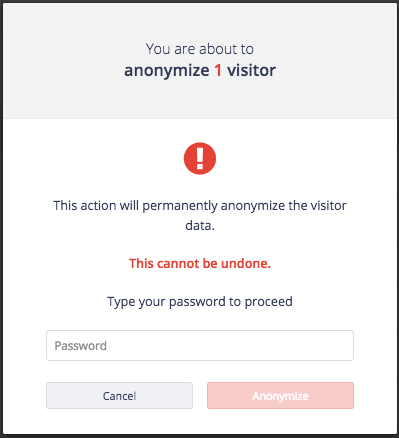 Confirm the action by entering your login password and click 'Anonymize'. Once the visitor is anonymized, the data will appear as shown below. *Please note, the visitor is now anonymized, this can be checked by navigating to the 'Timeline' view. You should now see the row entry with all personal information removed. In busy times, this process may take a minute or two, so please refresh your page.